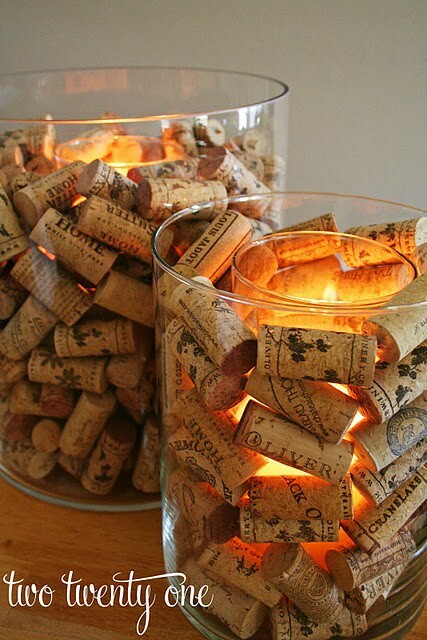 I need more corks to complete the Wine Cork Candle Holder. Once finished, I promise that I will post a picture of my version. Want to make one yourself? Follow a fantastic tutorial here. I purchased the outer clear glass cylindrical vase for $4.99 from HomeGoods. It is 5 inches in diameter and 8 inches tall. 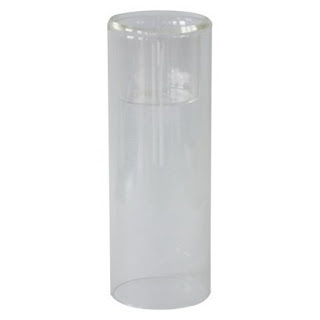 I also picked up a clear glass tealight holder to go inside for $3.89 at Target. It measures just over 2 inches in diameter and around 6 inches high. It's actually clear and not frosted or colored in any way. Unsatisfied with the amount of light it was giving off, I actually flipped the tealight holder upside down. Now that the flame is positioned much lower, it gives off more light and more closely resembles the finished product featured above. It seems that replacing the tealight with a votive candle would make the flame perfectly centered, but I only possess tealights and two sizes of jar candles. I had 34 corks in various containers around my apartment and dropped every last one in there. A lot of them were kept from my senior year of college. Anyway, I would like to collect about a dozen more to cover the tealight holder's rim and to complete this craft project. I must drink more wine this summer! Cin cin!